Sharks in the sea are a vital element in earth’s survival, seeing them in an aquarium brings them up-close and personal! Throughout the ages people of been fascinated, thrilled, frightened, and horrified by these creatures. They have been the subject of myths, novels, and in modern times, movies and documentaries. Most recently the Discovery Channel’s Shark Week brought lots of attention to these animals. But exposure now needs to extend beyond thrills, to an understanding of these incredible animals and the important role they play in our world. In the oceans, sharks regulate the quantity and health of other fish. Keeping them alive and well in their natural home is vital to a balanced marine ecosystem. Many of these fascinating animals can be seen in aquariums. This offers each of us the opportunity to know what they are and gain an understanding of them. Not all sharks can be kept in an aquarium, but for those that can, imitating ocean habitats are necessary for them to thrive. Sharks are apex predators. They reside at the top of the food chain and often have no natural predators of their own. The shark’s role in the ocean ensures that all parts of the food chain are controlled. Through their voracious appetite, they regulate the quality and health of other marine animals. This in turn helps maintain the oceans ecosystem which is crucial to life on earth. For some time it was assumed that removing Sharks from the ocean would result in a huge increase in fish. Scientists now believe the opposite to be the case. Sharks tend to feed on the old, as well as the weak and unhealthy fish. This helps stop the spread of disease among fish, preventing an uncontrollable wipe out of whole populations. They also help eliminate competition which in turn creates a stronger gene pool, resulting in a more diverse population of sea creatures. With sharks at the top of the food chain the lower parts are controlled. A natural balance is maintained with populations at each level doing their particular job. Things like algae, which produce about half of the world’s oxygen, are one example of where devastation could occur without control. If large enough populations of its proper predators go missing, like Parrotfish, algae would spread uncontrollably creating a drastic change in oxygen quantities. These types of drastic changes could be devastating to all life on the planet. Most of the world’s sharks are in big trouble. In some areas where there is adequate management, shark populations have stabilized. Throughout the rest of the world however, populations are being diminished, primarily through shark fishing. Researchers say around 100 million sharks are taken by fisheries every year. Sharks at sea Conservation – you can help! Every three years the Convention on Migratory Species (CMS), a global wildlife treaty with 120 Parties, convenes to discuss and make proposals on animals at risk. They will be meeting from November 4-9, 2014 in Quito, Ecuador. This convention is uniquely suited to facilitate conservative actions. You can join in conservation efforts for these animals right now. The Project Aware group, which represents the diver voice worldwide, will be addressing sharks and rays at the convention. They say that “21 species of sharks and rays are on the agenda – including some of our favorite hammerheads, silky sharks and reef mantas.” Every voice counts and they offer a “3 Minutes of Action for Sharks and Rays?” where they guide people through sending a letter, using social media with the hashtag#SharksWithoutBorders, and following their progress on Twitter using #CMSCoP11. Sharks have evolved over millions of years. Jason Russell, in his article Free Roaming Shark Aquarium, gives a wonderful overview of them in pop culture, history, and the aquarium. He says they are very adapted to their unique environment and do not handle change very readily. The majority of sharks should really only be kept by expert aquarists. Water quality in the shark tank needs to be optimal at all times; there is no room for error. These are also nervous fish and stress can quickly cause disease and illness, a result of both shipping and busy activity outside the tank. The biggest challenge in the aquarium is limited space. Russell states that this is especially important for free roaming sharks that will swim for miles in the ocean as they prowl for food. They need an open swimming environment with minimal decor to avoid being damaged. 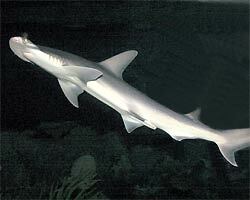 Some types of sharks can also get very aggressive, like the Bonnet head Sharks, and often need to be kept alone. 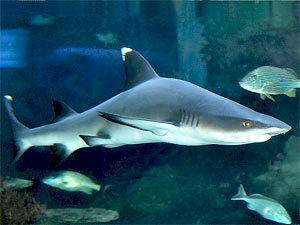 Blacktop Reef Sharks are a type of free roaming shark that is frequently seen in aquariums. Russell says these guys won’t survive in a 1000 gallon tank. A 3000 gallon tanks would be the bare minimum, and adults will really need 5000 gallons or more. The nice thing about these large bodies of water, they don’t change chemistry very quickly, so it’s easier to maintain quality conditions. Shape of the aquarium is also very important for these constantly moving, free roamers. The aquarium needs to be round or have rounded corners. They can get stuck in square corners and damage themselves. 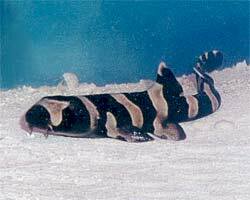 Bottom dwelling sharks like the Bamboo Banded Shark, Catsharks, Hornsharks and others, are a bit less demanding. Although they can reach a considerable size, they aren’t as active. Russell says they should have a specially shaped tank with an adequate water volume. The 180 gallons that is often recommended is really only suited to a juvenile. They will eventually need at least 500 gallons as the bare minimum. The water quality must also be well maintained and the feeding regimen taken into account. Most sharks in the aquarium are really best left to public aquariums. There the professionals have the facilities and means to properly care for them. The ocean, of course, is the ideal habitat for sharks! 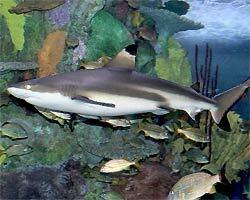 Yet for people to gain understanding, seeing sharks in aquariums makes the experience personal. Knowledge, respect, and a rise in concern to keep these majestic creatures well just doesn’t come from pictures and video! Photos courtesy of Animal-World.com contributors, see these and more on Dr. Jungle’s Pets and Animal Photos: Sharks. keep me updated with cool under water videos thank you!